Dean James B. Steinberg has announced the creation of a new faculty award, the Maxwell School Tenth Decade Faculty Scholar, to recognize and encourage excellence in citizenship teaching, research and public engagement at the Maxwell School. 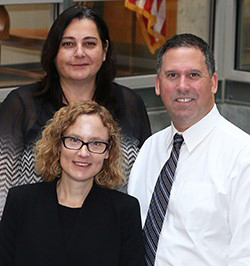 Three current Maxwell School professors have been named inaugural Tenth Decade Scholars: Carol Faulkner (history), Andrew S. London (sociology) and Tina Nabatchi (public administration and international affairs). The award will provide each recipient $5,000 per year for three years to support their work. The Tenth Decade Faculty Scholar award program has been created as part of the larger Tenth Decade Project—a collection of programs, projects and other initiatives developed to foster innovation and collaboration in the years leading up to the school’s 2024 centennial. The Tenth Decade Project emphasizes Maxwell’s legacy of interdisciplinary citizenship education and scholarship, and a commitment to sustain that tradition of excellence into Maxwell’s second century. Tenth Decade Faculty Scholars were selected based on their exemplary record of research and teaching. Grants provided through the Tenth Decade Faculty Scholars initiative will be used to benefit the faculty members’ research and curricular development. Current funding has allowed for three awards, but it is anticipated that additional philanthropic support in the months and years ahead could provide new awards that will recognize additional Maxwell faculty. Each of the inaugural appointees expressed appreciation for the Maxwell School’s citizenship traditions and their opportunity, now enhanced, to contribute to the school’s future. Faulkner’s research focuses on the history of American social movements, particularly women’s social and political activism in the 19th century. Her books include “Women’s Radical Reconstruction: The Freedmen’s Aid Movement” (University of Pennsylvania Press, 2004), “Lucretia Mott’s Heresy: Abolition and Women’s Rights in Nineteenth-Century America” (University of Pennsylvania Press, 2011), and “Women in America to 1880: A Documentary Reader” (Wiley-Blackwell, 2011). A professor of history, she is currently serving as the interim chair of the undergraduate Maxwell Program in Citizenship and Civic Engagement and teaching its core seminar on “Justice, Ethics and Citizenship.” Faulkner holds a Ph.D. from Binghamton University. London is a professor of sociology whose research focuses on the health, care and well-being of the stigmatized and vulnerable, including persons living with HIV/AIDS; caregivers; welfare-reliant and working poor women and their children; lesbian, gay, bisexual and transgender persons; persons with disabilities; the formerly incarcerated; older adults; and veterans. He is a former chair and the current graduate director of Maxwell’s Department of Sociology. In 2015, he received the University’s Excellence in Graduate Education Faculty Recognition Award. He was a National Institute of Mental Health Postdoctoral Fellow (while at UCLA) and holds a Ph.D. from the University of Pennsylvania. Nabatchi’s research and teaching broadly address issues of democratic governance in public administration, and specifically focus on citizen participation, collaborative governance and conflict resolution. Nabatchi, an associate professor of public administration and international affairs, is the lead editor of “Democracy in Motion: Evaluating the Practice and Impact of Deliberative Civic Engagement” (Oxford University Press, 2012) and wrote two recently published books: “Public Participation for 21st Century Democracy” with Matt Leighninger (Jossey-Bass, 2015) and “Collaborative Governance Regimes” with Kirk Emerson (Georgetown University Press, 2015). She is the primary investigator on a major federal grant from the U.S. Department of Health and Human Services, investigating public deliberation in health policy while also engaging average citizens in consumer-centered patient-care strategies. Nabatchi holds a Ph.D. from Indiana University, Bloomington.